The Minnewaukan Public Library opened in April 1978 on Main Street in the Memorial Building . Minnie Christensen was the first librarian. She retired in 1986, and several ladies- among them Ginny Sears, Sheryle King and Norma Schmid- held the position until 1991. 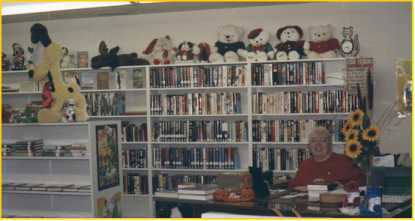 September 1991 Cathy Burkhardsmeier was named librarian. At that time the library had about 5,000 books and was open 19 hours per week. The library started in the northwest corner room in the basement of the memorial building. Within the first year it moved down the hall to occupy the rooms next to the city office. 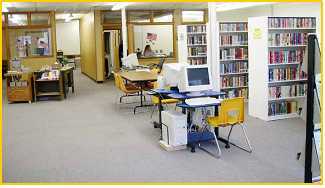 Then in March 2003 the library moved to its present location by the grocery store, occupying and expanding in the former Milson Ball (USDA) building. The library now has computers for public use and expanded children�s books and reference departments. At present there are approximately 12,000 books. Cathy Burkhardsmeier retired in August 2015. JON LOMMEN FORMER LIBRARIAN PASSED AWAY IN FEBRURAY 2018. Library Hours: Mon. & Wed. 9-4 during City office hours or when the light is on!! A gift shop is open during library hours. Items include birdhouses,wood signs, jewelry, cards, baby blankets, hats, rugs, pot holders, dish cloths all made locally by crafted individuals. *Special Note: Thank you to Anna Halko for designing the Minnewaukan logo and Cathy Burkhardsmeier for coming up with the slogan.